Regular dental examinations are important for the health of your teeth, gums, and mouth, but what you may not know is that your dentist is also checking your mouth out for signs of oral cancer. Like most oral problems, oral cancer can be most easily treated when it is caught early, so it is important that you have regular screenings to detect the first sign of a problem. An oral cancer screening will likely be a part of your regular oral exam, and you may not even know that your dentist has already been looking for signs of oral cancer. He or she will examine the tongue and inside of your mouth in order to look for sores or discolored patches. Your dentist may feel around in your mouth to look for lumps and abnormalities, and if something unusual is found, further testing may be ordered. If your dentist does find something suspicious and orders additional tests, you shouldn't be worried. Many benign conditions of the oral cavity can mimic cancerous lesions and are perfectly harmless. However, oral cancer screenings should be continued at least once per year to ensure the optimal health of your mouth. While your dentist will be the best source of information about oral cancer, you don't have to wait until your next checkup to take a look at your own mouth. In fact, it is always a good idea to become familiar with your mouth structures so that you can identify areas that seem to have changed. Conducting self-exams in between your dental appointments could help you to detect a problem in the early stages, which is important since most forms of oral cancer can be treated successfully when diagnosed early. 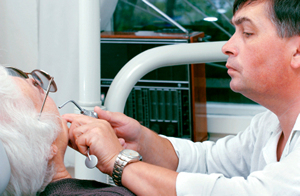 If it has been awhile since your last oral cancer screening, contact our office to set up an appointment.